Your Celebrant - Handfastings by Cara, civil and religious marriage celebrant. Cara is an Non-discriminating Religious Marriage Celebrant appointed by the Attorney General's Department to solemnize marriages in Australia. Appointed in 1997, she is currently the longest serving Religious Marriage Celebrant catering to the Pagan community in Australia. She does not discriminate. 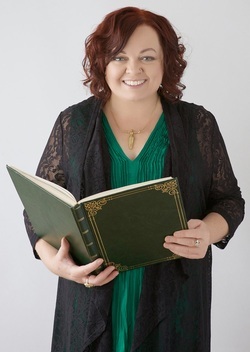 Cara undertakes professional development activities annually, and has been satisfactorily reviewed by the Marriage Celebrant's and Marriage Law section. Her registration is in good standing and as a Religious Marriage Celebrant she has passed a 'Working with Children Check' which is valid till 11-11-2019. She specializes in the civil and religious marriage ceremony known as a handfasting. "According to the law of grown ups it's my responsibility to solemnize marriages. What I relish is the pure joy and playfulness, the bliss, that a loving couple brings to a handfasting." As a witch, Priestess and celebrant Cara has led many rituals, large and small, in every mainland Australian state and overseas. She recently constructed a stone circle in her garden and has built a temple dedicated to the Goddess Amphitrite adjacent to her Home. In 1991 she co-founded the Witches Guild at Deakin University and is also a long standing member of the Fellowship of Isis. Cara's qualifications include undergraduate degrees in architecture and she recently complearned adoctorate. Her research focused on people who build their own houses. She is a published poet and also has qualifications in carpentry and a variety of computers applications. She has worked and been active in the community sector for many years, focusing on housing and women's health. Cara's favorite recreational activities include crafting with her grandchildren, watching roller derby, practicing genealogy and gardening. Your rights are protected under Australian Law - ﻿consult the Code of Practice for Marriage Celebrants or ﻿﻿lodge a complaint﻿﻿.. Copyright ©2017 Caroline 'Cara' Denigan. All rights reserved.